Las Vegas Sands Corp., the gaming company controlled by billionaire Sheldon Adelson, reported first-quarter earnings Wednesday that easily surpassed analysts’ estimates as growth at its Macau properties accelerated. The casino company last year increased its share of the Macau market with the opening of Sands Cotai Central, its fourth casino in the Chinese gambling enclave. Las Vegas Sands is building The Parisian, its second Cotai Strip resort at a cost of $3 billion. Las Vegas Sands net income for the quarter was $572 million, or 69 cents per share, compared with $498.9 million, or 61 cents per shares, in the first quarter of 2012. Analysts surveyed by Yahoo Finance expected earnings of 67 cents. Revenue for the first quarter reached $3.30 billion, beating estimates of $3.27 billion, and an increase of 19.5 percent from $2.76 billion in the same period last year. “I am extremely pleased to report all-time record quarterly financial results that reflect strong revenue and cash flow growth and steady execution of our global growth strategy,” Adelson said. Las Vegas Sands reported earnings after the markets closed Wednesday. Shares of Las Vegas Sands were unchanged at $56.25 at the close of the New York Stock Exchange. The shares rose 0.96 percent, or 54 cents, to $56.79 in extended trading. At Sands China Ltd., the company’s majority owned Macau subsidiary, net revenue jumped 39 percent to $2.02 billion, compared to $1.45 billion in the first quarter of last year. Net income increased 63.3 percent to $452.9 million, compared with $277.4 million. Sands China operates The Venetian Macau, Four Seasons Hotel Macau and Plaza Casino, Sands Macau, and Sands Cotai Central. Net revenue from the company’s Marina Bay Sands property in Singapore was down 6.3 percent at $794.9 million. Adjusted property EBITDA was $396.8 million for the first quarter . Meanwhile, the company’s Las Vegas operations reported net revenue increased 7 percent to $411.5 million, while Sands Bethlehem in Pennsylvania revenue increased 6.3 percent to $122.9 million. The operating results at the Strip properties, The Venetian, The Palazzo and Sands Expo and Convention Center, were favorably affected by higher than expected table games win percentage of 27.6 percent for the quarter, the company said. The company also announced its next recurring quarterly dividend of 35 cents per common share will be paid on June 28 to shareholders of record on June 20. Adelson told analysts that Las Vegas Sands has returned $4 billion to shareholders over the last five quarters in terms of dividends. 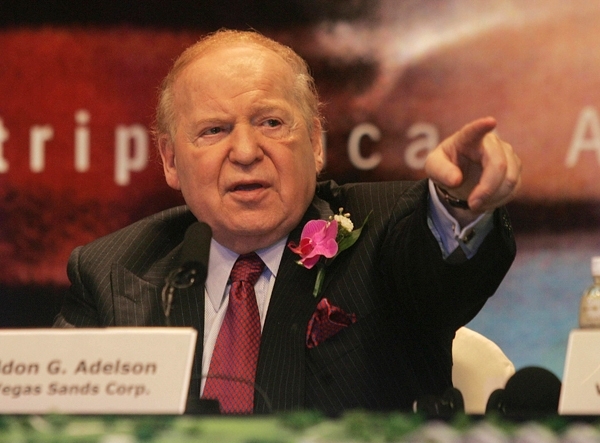 “We have every intention of returning more cash to shareholders,” Adelson said. The company’s capital return program could include bond sales, similar to a plan recently announced by Apple Inc. The Cupertino, Calif.–based company is said to be planning to help finance its $100 billion promised return to investors by selling $17 billion of bonds. Las Vegas Sands said in a March regulatory filing that an internal audit had revealed “likely violations of the books and records and internal provisions” of the Foreign Corrupt Practices Act, a federal law that bars payments to foreign officials for favors. Last week, Pricewaterhouse Coopers LLP, Las Vegas Sands’ auditor since it went public in 2004, resigned. The casino operator said there had been not reportable disagreements with Pricewaterhouse and that it is seeking a replacement.